No office can function without a little humor and craziness. 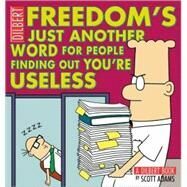 Adams turns mundane office issues into excruciatingly funny office moments.InFreedom's Just Another Word for People Finding Out You're Useless, fans get a hilarious collection of greatDilbertstrips that are anything but useless. From office politics and reams of red tape, to mayhem due to new technologies and, of course, the crazy cast of co-workers, Dilbert gets it done.